Kelly's are a family run business, established in 1957, and have been serving the Irish market for over 60 years. equipment. They are a certified CLAAS Harvest Centre and carry the full range of CLAAS agricultural machinery and Horsch tillage equipment amongst other leading brands. Successful candidate will be expected to service a wide range of agricultural and plant machinery. Over the duration of the four- year programme applicants will attend set block periods of training. Must have knowledge of the agricultural machinery industry along with a good knowledge of IT. experience is preferable, comprehensive training will be provided for this role. A good knowledge of tillage and the machines used is essential. Applicants are all required to be team players with good IT and communication skills. 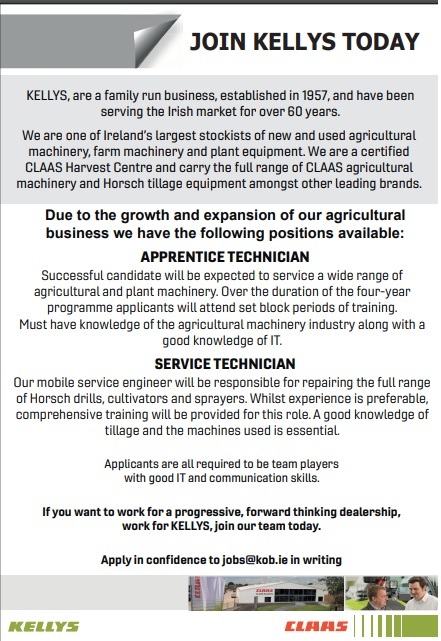 If you want to work for a progressive, forward thinking dealership, work for KELLYS, join their team today.